The SharePoint server range of courses from Simplilearn provides necessary skills and knowledge to configure and maintain a SharePoint Server 2013 environment. Participants learn best practices such as enterprise content management, service application architecture, business intelligence solutions, implementing governance plan and other relevant skills pertaining to SharePoint Server 2013. The courses under the SharePoint Server 2013 category is ideal for IT professionals who wish to learn more about the latest version of the SharePoint Server 2010 & 2013. IT technicians looking to learn about installing, configuring, implementing and managing SharePoint Server 2013 in the cloud and/or data center will be greatly benefitted from the course. Enhanced domain expertise in SharePoint Server 2013. Better knowledge in organizing, collaborating and sharing information across organizations. Better career opportunities Globally acclaimed IT certification. After taking this online course from Simplilearn, I have to say that the training was very knowledgeable and informative and I got an insight on the SharePoint concepts and principles in a clear manner. The well-structured content was an added bonus. I thoroughly vouch for this course. The training helped me to get a first idea about the changes in the user interface. I am now confident to use my skills on the professional front. This expert level online course has imparted necessary skills and knowledge to me to confidently configure and maintain a SharePoint Server 2013 environment. I would highly recommend this course to my peers. I was specifically looking for an online course which would help me to learn more about the latest version of the SharePoint Server 2010 & 2013. This course has helped me in my pursuit. A good overview on using SharePoint and managing site pages. If you're looking for a complete course on SharePoint capabilities, this is the course for you. 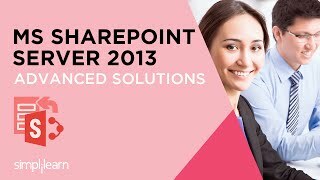 This training provides a good overview on how to use the basic SharePoint 2013 features. Totally satisfied!